The Almshouses provided a perfect setting for the recent Christmas Fair. 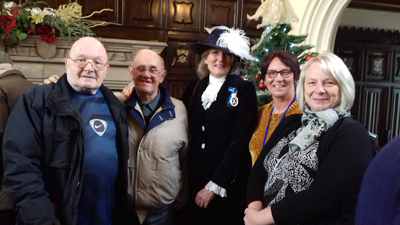 It was attended by Mrs. Clare Sawdon, High Sheriff of Warwickshire who spent an hour enjoying refreshments and chatting to both residents and members of the public. She was welcomed by Mrs. Jane Corrigan, a Trustee of the Nicholas Chamberlaine Trusts. The High Sheriff praised sisters Ann Haywood, Scheme Manager, and Vikki White, her Deputy, for their work at the Almshouses. Together with a group of hard working residents they had beautifully decorated the Governors Hall and Residents Lounge. Christmas items were on sale along with home-made cakes, a raffle and tombola, with proceeds going to the Residents Social Fund. A number of trips are being arranged for the spring and summer. From left to right - Almshouse residents Steven Moore, Ray Massey, the High Sheriff, Vikki White and Ann Haywood. 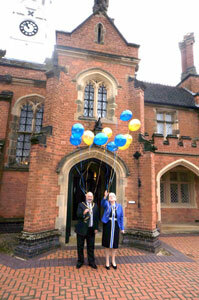 Almost 1000 Bedworth schoolchildren sang their hearts out at the special service in the Quadrangle of the Almshouses. There were hymns, historical readings, a short address and prayers. Rose, Lady Daventry, also presented local Schools with a financial gift for their libraries. The bells of All Saints Parish Church rang in thanksgiving as the service ended. Guests were then invited to the Church for the unveiling of a memorial plaque to Nicholas Chamberlaine. Music was played on a Clavinova by the Rev. Rupert Jeffcoat who had chosen a special piece composed by the Rev. Richard Mudge, a former Bedworth Rector who died in 1763. Glorious sunshine welcomed hundreds of visitors to the Almshouses to enjoy stunning floral displays by members of the Nuneaton Flower Guild. Eighteen arrangements reflected Bedworth's history from weaving to hats and from coal mining to engineering. Each one had been sponsored and added to the beauty of the Elizabethan-styled cloisters and panelled Governors Hall. A vintage pram collection was hugely popular as were the delicious home-made cakes that together with donations raised 729 pounds for Myton Hospice. A huge thank you from the Trust to everyone who took part and to all those who came to support the event. Nicholas Chamberlaine Trusts launched it's website on Heritage week-end - September 14th 2013. 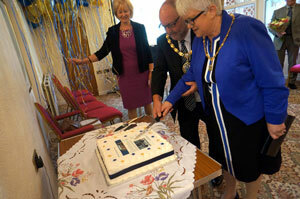 The Mayor of Nuneaton and Bedworth, Councillor Bob Copland and Mayoress Elaine Copland were guests of honour joining residents, Governors and members of the public as the site went live. Councillor Copland pressed the computer button launching the site which was designed by Paul Beedham, an IT professional. They both cut a special cake and sent balloons into the sky.